HUNGARIAN - SPORT S BAR "SPORT SZELET"
A real Hungarian treat! Made with rum and cocoa flavored chocolate bar! This great tasting chocolate bar will energize you throughout the day! Duna Kavics - Blue Danube Rock Candies [ ] $2.95 ea. [ ] ¼ lb - Small Container  $ 5.95 ea. Medium Box $ 8.95 ea. Large Box $ 12.95 ea. Plain chocolate with marzipan filling. Mix-and-Match RITTER SPORT MINI 24 / 150 G.
RITTER SPORT SCHOKO WUERFEL / CHOCO CUBES 240 G.
RITTER SPORT AMARENA KIRSCH 100g. [ ] Kinder Happy Hippo - "Cocoa" $ 5.95 ea. 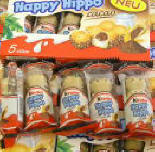 [ ] Kinder Happy Hippo - "Hazelnut" $ 5.95 ea. 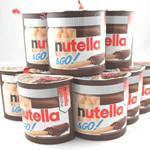 [ ] 100 g. SPECIAL: 3 for $ 5.95 or $ 2.25 ea. [ ] 100 g. SPECIAL: 3 for $ 5.95 or $ 2.95 ea. Brandt Chocolate Lucky Ladybugs - "Katicabogár"
Imported from Germany. These beautiful chocolate ladybugs are guaranteed to bring you good luck. Delicious sold milk chocolate. 12 g.
[ ] "Gift Box"  5.3 oz. "Ha ilyet eszik ki nö a foga!" POTATO ENERGY CHIPS! A Natural glucose. and athletes for hundreds of years. Great for a natural safe pick up feeling. [ ] ¼ lb. (5 packet) $ 10.95 ea. [ ] ½ lb. (10 packets) $ 19.95 ea. Imported from Germany "Edel-Marzipan" $4.75 ea. [ ] Milk chocolate with praline filling $ 4.95 ea. [ ] Milk chocolate with truffle filling $ 4.95 ea. 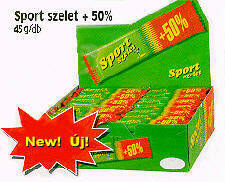 Hungarian Sports Bar - "Sport Szelet"
Kinder chocolate was the first chocolate especially developed for children. The special in this chocolate are the extremely high creamy milk filling and the unique milky taste .. Each box Kinder chocolate contains eight individually wrapped tiny bars. Price per 1 item: $1.95 ea. From 2 to 6 bars 5.00% $ 1.85 ea. 7 to 11 bars 10.00% $1.75 ea. 12 or more bars 20.00% $1.55 ea. Price per 1 item: $2.95 ea. Kinder BUENO is a fine composition from airy waffle and tender milk hazelnut cream - of two different kinds chocolate wraps. A pleasure experience seeming easy uniquely arises from it. 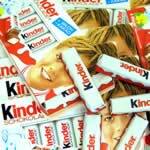 Kinder is a famous product of the Italian manufacturer Ferrero. 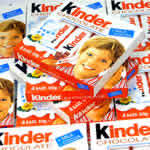 Kinder is also one of the most popular chocolate brands in Germany. 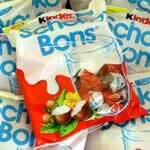 Ferrero Kinder Chocolates are well known all over Europe and now in the USA. 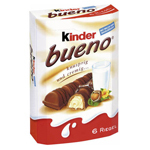 Kinder offers a large assortment: children's favorite Kinder Eggs with a toy, the ultimate crispy dessert Kinder Bueno, the regular Kinder chocolate, Kinder Country with cereals and many more. Price per 1 item: $1.45 ea. 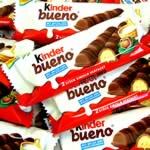 From 15 to 29 Kinder Bueno Bar $1.35 ea. 30 or more Kinder Bueno Bars $1.25 ea. 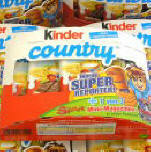 KINDER Country. The unique to Kinder Country are the Cereals in an extensive milk filling. Their taste is on account of the special production procedure which makes them light and crisply. 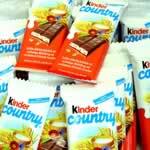 The unmistakable taste is rounded by the tender Kinder Country milk chocolate. 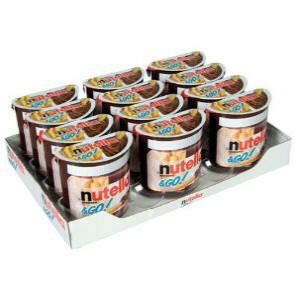 Ferrero Duplo 10 pack. 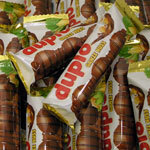 DUPLO is the " probably longest chocolate of the world". 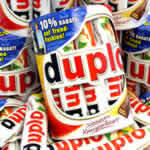 Duplo is fine composition of several layers - waffles with tender nougat cream and is wrapped up by milk chocolate. Price per 1 item: $1.49 ea. Kinder Chocolate 50g (Schokolade). Each box Kinder chocolate contains four individually wrapped tiny bars. 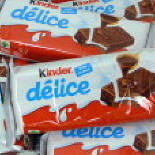 KINDER Delice - double layer of soft dark chocolate cake, filled with the famous Kinder Milk, covered in rich, dark chocolate. Net weight is 42 grams per bar (approx 1.5 oz. each ). Kinder Eggs (One Dozen) 12Ps. Please note, Kinder Eggs contain small parts within each plastic capsule enclosed by chocolate candy. We do not carry this product in the USA, but it is available from our other store in Hungary. 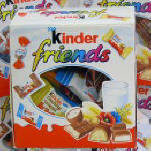 A variety pack of Kinder items! A great value! KINDER Happy Hippo Cocoa - crispy cookie-wafer bar with creamy milk and chocolate filling in a hippo shape. Irresistible! from 2 to 6 items 4.75 ea. 7 and more items 4.55 ea. 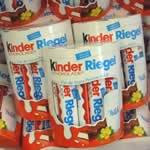 Kinder Riegel is chocolate stick with five milk chambers. Each of Kinder Riegel multi stack contains 10 individually packed chocolate sticks filled with a milk cream filling. Net WT. 210 gr. Price per 1 item: $7.95 ea. 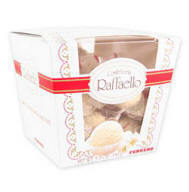 [ ] Single Pack $ 2.89 ea. [ ] Case of 24 $ 59.95 ea. Made with roasted hazelnuts cocoa and milk.  4 Pack Package for $ 7.75 OR $ 1.95 ea. GREAT TASTING! A BEST BUY! Tastes great on Bread, Croissants, Crepes, Crackers and more. 8 individually wrapped milk chocolate bars with a milky filling. [ ] $ 2.50 each. 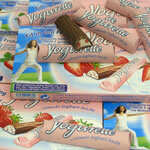  100 g.
or [ ] 10 Pack Case • 100 g. for $17.95 ea. [ ] $ 4.95 ea.